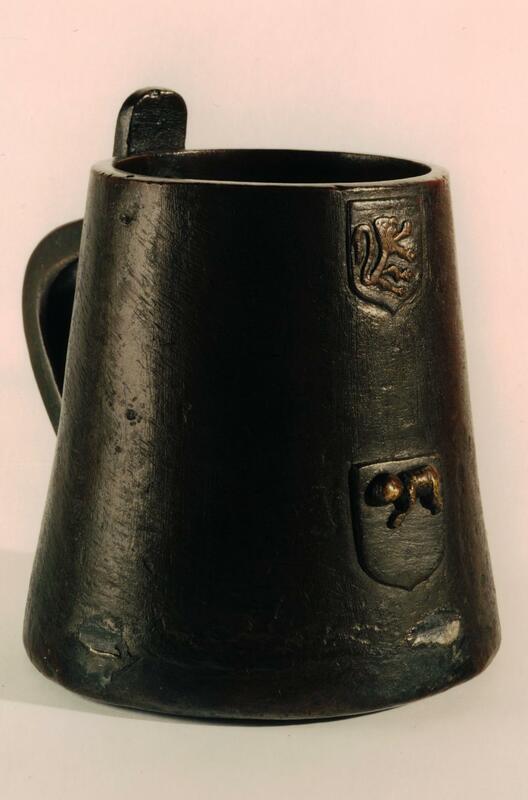 The Stirling Jug or Scots Pint is one of the oldest artefacts of the Royal Burgh of Stirling. Investigation by specialist staff at the National Museum of Scotland has dated the Stirling Jug to 1511, when it was manufactured at Edinburgh Castle by Robert Borthwick who was “maister meltare of the kingis gunnis”. Borthwick’s main job was casting canons for the defence of the realm, and the demand for accurate casting of measures could be met by his workshop. The Stirling Jug was the national standard for liquid measure, and was held by Stirling as the burgh was in the centre of a thriving brewing industry. It was first instituted by Act of the Scottish Parliament in 1457. The Jug held the equivalent of three imperial pints. It has the symbol of the lion rampant, and another image which is thought to be that of the Christ Child. When later copies were made after the Reformation, the symbol was changed to that of the Stirling Wolf. Before being deposited in the Smith, the Stirling Jug was an important piece of burgh insignia often paraded in civic processions.